The Animal Health Trust, which is conducting tests for the BHA, has already received some 2,100 nasal swabs from stables across the country and has analysed about 720 so far. It has told the BHA there have been no further positive samples returned from those tests. That includes swabs taken from three suspected cases at the yard of trainer Rebecca Menzies – although they will “remain under close surveillance”, the BHA said. “Though hundreds of tests have been completed already, there are many hundreds more to be analysed over the weekend before we will have a fuller picture,” Sykes said. A total of 174 racing stables have been placed in lockdown while tests are carried out – though the six positive cases identified to date all came from the Cheshire stables of Donald McCain. Equine influenza – like human flu – leaves infected horses suffering with coughing and runny noses and feeling run down. The BHA confirmed the strain of this outbreak is the Florida Clade 1 strain, endemic to North and South America – a more virulent type than the Clade 2 strain that’s endemic to Europe. British horses are vaccinated against both strains, but the more powerful American flu can affect vaccinated horses. 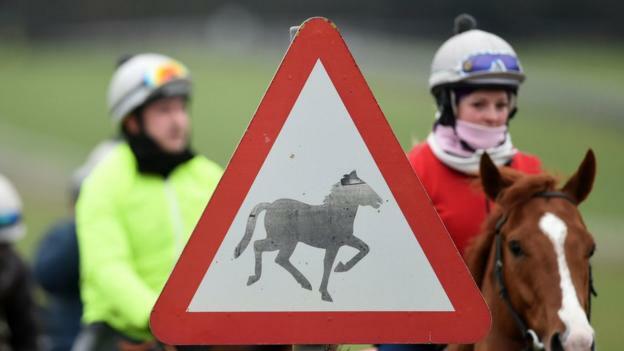 The BHA said it would make a decision on Monday as to when racing can resume, adding that it was “already planning for a variety of scenarios under which racing may recommence”, including rescheduling meetings and races that have been cancelled. “We are planning as normal for the Cheltenham Festival,” a spokesperson continued. The meeting, which is due to begin on 12 March, is one of the biggest events in the racing calendar. The decision to suspend all racing and place almost 200 yards in quarantine has been criticised in some quarters, with leading trainer Nigel Twiston-Davies telling the Racing Post it was an “overreaction”. But experts from the BHA’s independent advisory Veterinary Committee praised the body’s leadership on the issue. “The actions taken have helped prevent the possible further spread of this highly infectious virus,” it said. ← Previous Story Equine flu: 174 stables in lockdown – what now for horse racing, Cheltenham and jockeys? Next Story → Equine flu: What is the cost to horse racing?